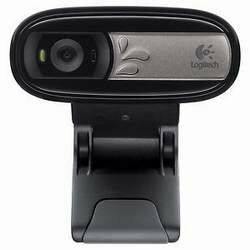 Logitech Webcam C170 - Web camera - color - audio - Hi-Speed USBLogitech Fluid Crystal technology. It's what makes a Logitech webcam better. Its smoother video, sharper pictures, richer colors and clearer sound in real-world conditions.The simple setup will have you video calling your favorite people in no time - on most major IMs and Logitech Vid HD.Your loved ones will see you in natural color when you talk to them, or you can take photos to share later.You can be heard loud and clear thanks to a built-in microphone that reduces background noise.